The Disturbance Reduction System DRS is an experiment package aboard the Euro- pean Space Agency (ESA) LISA Pathfinder spacecraft. LISA Pathfinder (LPF) launched from Kourou, French Guiana on December 3, 2015. LPF successfully demon- strated the disturbance-free motion of two test masses at noise level acceptable for a future gravitational wave (GW) observatory [1, 2]. Designated ST7 DRS is a NASA contribution to LPF with the goal operating disturbance reduction technology in space applicable to GW missions and other future missions with challenging stability requirements. DRS flew two clusters of four, low-noise, colloid micro-thrusters (eight total) and a computer which implemented drag free control laws. At specific times during the LPF mission, DRS operated as alternative to the ESA provided thrusters and control laws. The location of the test masses relative to the spacecraft and the attitude of the spacecraft were measured by ESA subsystems and provided to DRS as its sensors. The displacement and attitude of the spacecraft relative to the two test masses was controlled using the colloid thrusters and electrostatic forces on the TMs provided by the LPF systems. The key requirements for DRS were to show that the thrust noise was less than 0.1 microN, and the spacecraft position noise was less than 10nm/sqrt( Hz) in the measurement frequency band of 1 to 30 microHz. ST7 also recorded the relative acceleration noise (delta-g) between the two test masses, a key metric for the GW application, but had no requirement did not optimize the delta-g performance because this is primarily dependent on the (ESA) inertial sensor. ST7 executed a primary mission in which the thrust noise of the thrusters and the performance of the drag free control were measured and a short extended mission which was used to optimize the performance and expand the operating range of the thrusters and control laws. The timeline of the ST7-DRS mission is available here, and the extended mission here. 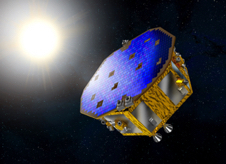 For overall information on the LISA Pathfinder Mission please see the ESA mission site. For the ESA full misison LISA Pathfinder data archive, go here. For additional information about the future LISA Mission go here, and to follow NASA involvement in the LISA mission, go here. If you have any questions concerning LPF, visit the Feedback form.